The village sign on the green recently had to be taken down, because the brackets that suspended it from its frame had worn through. 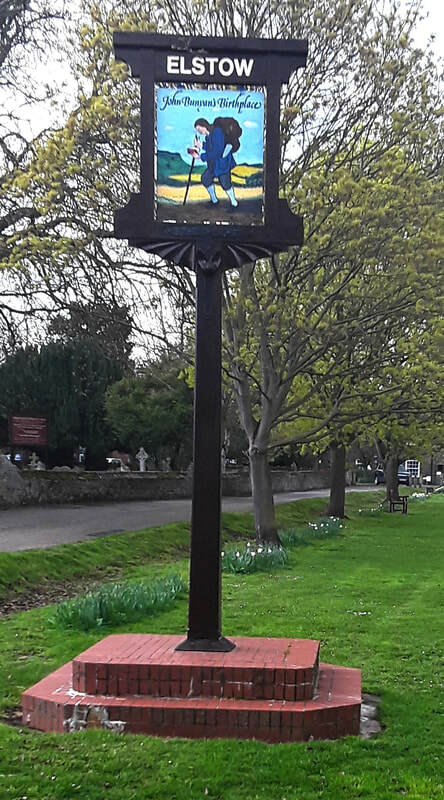 The Borough's carpenter has now repainted the the wooden post and frame; the paintwork on the sign has been restored and lacquered by Moot Hall's curator; and the sign was re-hung on Monday. Takes place on Friday the 5th April at 7pm for 730pm at Elstow Village Hall. 6 to 8 people per team. £8 per person entry fee, which includes a light supper of Bangers and Mash or Chicken Curry. All proceeds to support the Elstow Playing Field. On Sunday 13th January 2019, a blue plaque was unveiled in Elstow High Street, at the entrance to St Helena restaurant. John Bunyan lived in a cottage on this site for the first four years of his first marriage. There has been a marble plaque in place on the other side of the gateway for some time but, as part of the Bunyan Round \Table initiative to raise the profile of Bunyan's heritage, it was felt that a proper blue plaque was needed. This was duly arranged by Jon Miles and Elstow Parish Council. Today, on John Bunyan's presumed birthday, a group of 'pilgrims' set out from Elstow to deliver a comprehensive Bunyan teaching pack to every school in the Bedford Borough area. This was carried out as just one part of an initiative to promote learning about Bedford's world-famous author. The pack included The Pilgrim's Progress Curriculum book (by Ruth Broomhill) with a 2 metre wide Pilgrim's Progress frieze, plus teaching resources, books and DVDs from the John Bunyan Museum and The Word bookshop. The project was initiated by the author, supported by members of the Bunyan Round Table group and was funded by Bedford SACRE and National SACRE. The 78 packs were hand-delivered today to the schools by members of Bunyan Round Table and other volunteers. The only remaining 2nd World War Army pillbox in Bedford is located in the Interchange Retail Park, yards from Costa coffee and the M&S food-hall. In October 2016, Elstow resident Jon Miles was with Denis Carr, an Elstow Parish Councillor, looking for byways, paths and bridle ways that have always been used but which are not listed anywhere. They were doing this because if these paths are not listed by 2020 on the local Council records, then they would be lost and could be built on by developers. On one of their walks, they discovered an overgrown brick building that they recognised as being a World War Two pillbox. There was another pillbox in Ampthill Road and one in Kempston Hardwick. Jon decided that, this being the only remaining pillbox in the area, it should be preserved. He spent a long time trying to raise money and asked English Heritage, British Legion, the Harpur Trust, Bedford Borough Council but all rejected his request. Eventually, Elstow Parish Council agreed to a grant of £1000, Borough Councillor Tim Hill offered £1000 from his Ward Fund and then the Gale Family Trust offered £1600. 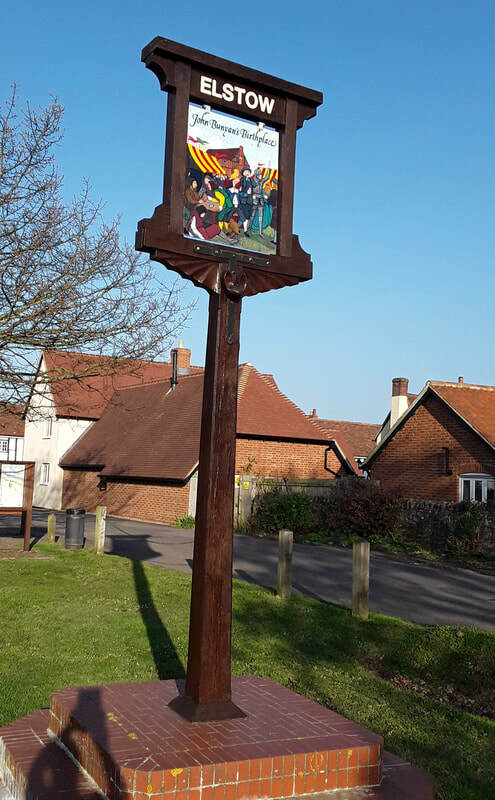 This reached the total that Jon had been quoted by builder Pelham Chambers, who has done lots of work for Elstow Parish Council to a good standard. The Gale Family Trust also agreed to the pay £515 for a lectern style information board. And Dr Michael Osborne donated £100 to the project. Jon became the project manager and spent a lot of time getting rid of 20 years of weeds and vines, some of which had gotten into the brickwork and had to be dug out at ground level. And, of course, when Pelham got into the job of restoration he and Jon soon realised it was a far bigger job than had first been assumed. The first three courses of bricks under the roof had to be removed, as they were disintegrating, almost to dust. The reinforcing rods crumbled to the touch but then the whole structure was 76 years old and had totally open to the elements for all of those years. The roof was a solid chunk of concrete so was thought to be, probably, okay but it was decided that a heat-sealed roof covering would be desirable to protect the slab and the building from the elements. Pelham knew the roofing contractor Malcolm Hendrickson and said he was good guy so Jon went to talk to him. Malcolm agreed to put on the roof covering at no charge - if he had charged, it would have cost about £1200. The outside walls were then covered with a cement screed, again to protect the brickwork. Jon decided it needed painting with anti-graffiti paint, to protect it from vandals and to blend in better with its location. Pelham began painting it (on Wednesday 20th June 2018) a dark gray/green colour. When it was built in 1942 there was less soil all around the building, so it was possible for members of the Home Guard to just walk in. However, now the door is a lot lower due to all the soil that has gathered around the building over the past 70 odd years. So steps and a railing have been added. The inside has not been altered and has its original whitewash finish. People can go in as long as they are careful - they do not have to book but if they contact Jon, he can arrange to be there and explain what the pillbox was for, why it is where it is and for safety. In August, once the interpretation board has been made, there will be an official opening. Jon Miles, Bunyan’s Mead, Elstow. Tim Hill - Liberal Democrat Councillor for Stewartby. Pelham Chambers - who undertook the restoration, work. Malcolm Hendrickson - roofing contractor. Dr Michael Osborne - author of 20th Century Defence of Britain. 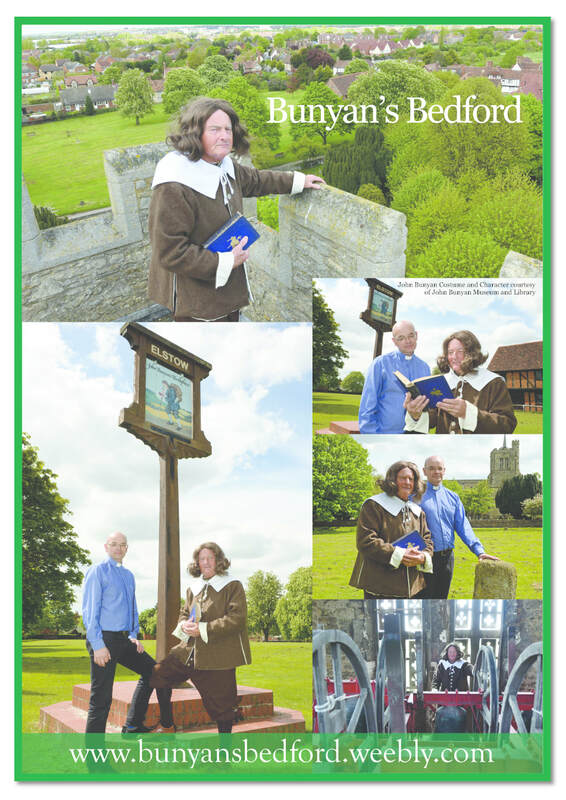 John Bunyan’s Round Table - is a new multi-agency group, formed to encourage international fans to visit Bedford and also to put his book back in local schools. 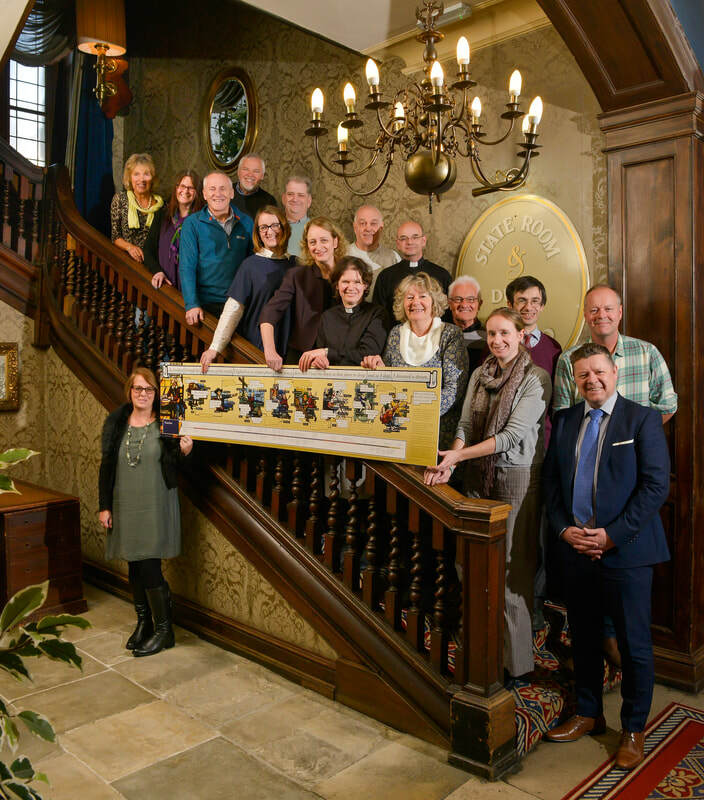 The photo, above, shows the “Round Table” group on the staircase (from original Palace Beautiful - Houghton House) at The Bedford Swan Hotel. The man whose work has been shared more widely than Shakespeare is being brought back to life in his home town (and beyond). John Bunyan’s The Pilgrim’s Progress has been more influential than any book in the English language, other than the Bible. Since being published in the 17th Century it has never been out of print and has been translated and cherished across the world. Today there is even The Pilgrim’s Progress “theme park" in South Korea, while visitors from the US and the Continent still make “pilgrimages” to Bedford and his home village of Elstow. Ruth is now working on a new book about the little-known sequel to The Pilgrim’s Progress based on the pilgrim Christian’s wife Christiana and family. The children’s book will be illustrated by Alasdair Bright and will include recognisable Bedfordshire landmarks and will recreate some of the monsters and challenges the family faced. She is working with children at Livingstone Primary School to help bring the story to life. “Bunyan has a worldwide fan base - his book was a revelation and created a revolution among Christians who took the message around the world. As it was an allegory it made the Christian story accessible to people in a way the traditional church’s teachings in Latin could not. Ruth describes it as ‘rather like Walt Disney meets God’. What happened to this model? 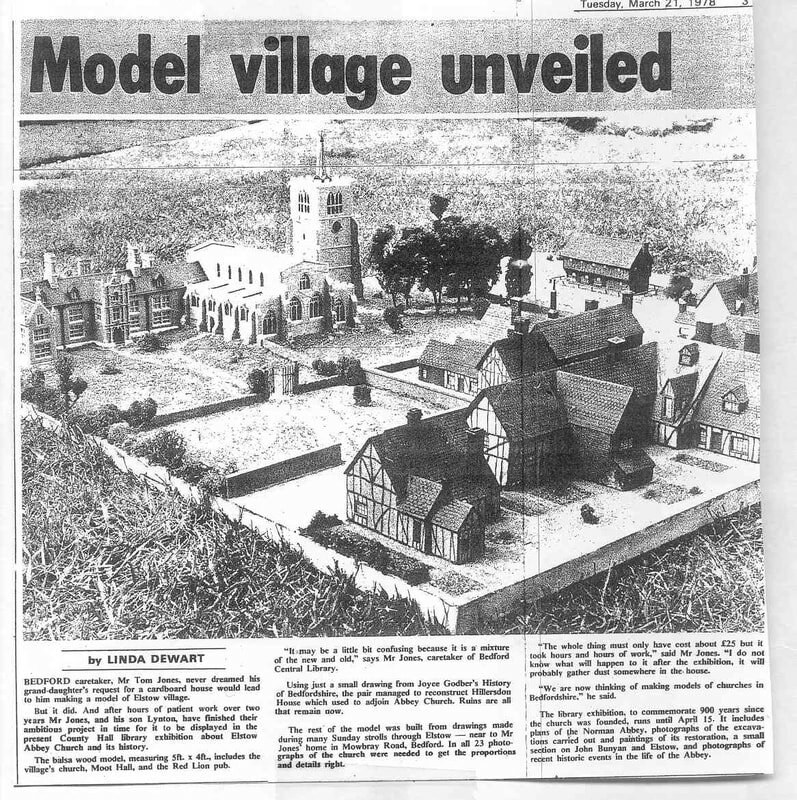 Does anyone know what happened to this interesting model of Elstow,made in 1975, or know the current whereabouts of the maker? His name was Tom Jones and I understand that he used to live in Mowbray Road. If you have any information, please contact Clive Arnold at Moot Hall.